I can hardly believe that September is over but ... it is! With the turning of yet another page in the calendar, I'm so happy to announce the winner of the September prize for the Miranda Hat charity KAL over on the Project: Stash KAL group on Ravelry. The winner is ... Renee and you should see the gorgeous Miranda Hats she knit over the course of the summer (she even knit several while on the beach)! Since this KAL was a true labor of love as the hats are being donated to everyone's charities of choice, I wanted the last monthly prize to reflect that same sentiment. 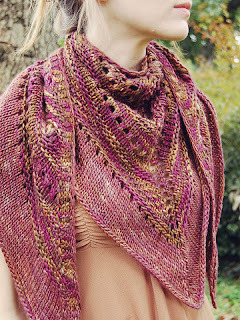 Renee's prize is a beautiful shawl pattern by Carina Spencer called Far Away, So Close. 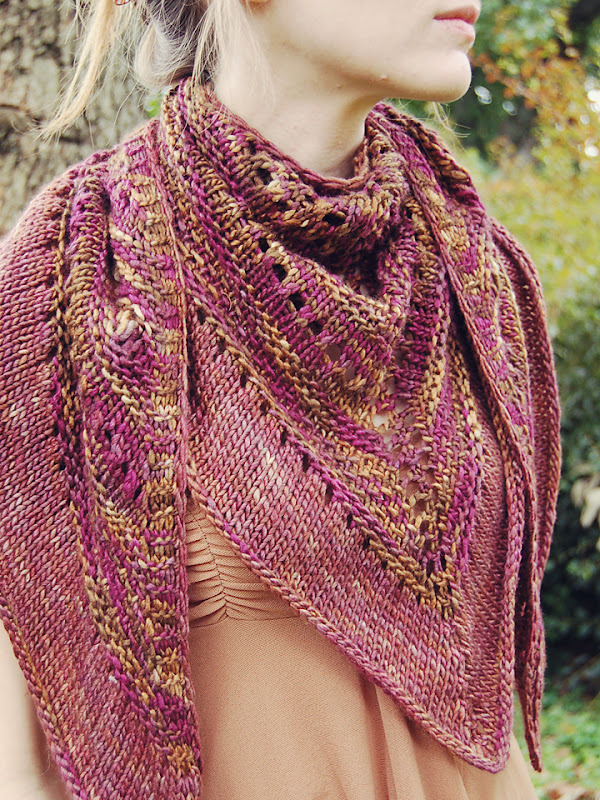 In Carina's own words, This shawl was originally designed as a gift to comfort a friend during a time of much grief. In honor of Infant Loss Awareness Month, each October all proceeds from the sale of this pattern for the month are donated to charities that offer support and guidance to families suffering the loss of a child. Congratulations, Renee! I hope you enjoy knitting this lovely shawl and thanks to everyone who knit a Miranda Hat in September. I am so grateful for the prize and to be a part of the charity KAL. We've warmed some heads, and hearts, this season. Thank you Evelyn for starting the Project: Stash group. Love the shawl worn like a bandana! Very pretty pattern, she is going to really enjoy knitting it! I agree with Ivy, a very pretty pattern. Its so great that you hosted this KAL, charities are going to be receiving some lovely handknit hats very soon! It was such fun knitting for good! Can't wait to read your post about you handing these great hats out at your charity, Evelyn!